After a year in exile, the Allman’s will once again be “Peakin’ at The Beacon” in 2011. 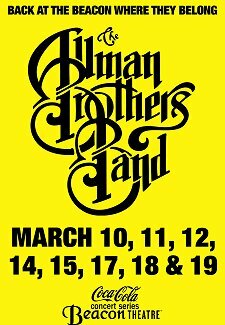 Over a 20-year span that ended in 2009, the Allman Brothers Band played some 190 shows at the Beacon, more than any other act, returning annually in March for monthlong residencies that made the band synonymous with the theater. But earlier this year the band lost its traditional booking to a Cirque du Soleil show, “Banana Shpeel,” and had to hold its 2010 residency at the United Palace Theater. Meanwhile, “Banana Shpeel” delayed its official opening until May, and then closed quickly after receiving poor reviews. Jay Marciano, the president of MSG Entertainment, acknowledged at the news conference that that booking arrangement had been a mistake.